My Sister-in-law made this for Thanksgiving and we could not stop eating it. I love the sweet, salty, tart combo. Trust me when I tell you, you might want to make a double batch. I used a mini food processor to chop the ingredients, but you can also chop by hand, which is what we did on Thanksgiving because we were staying in a condo. I would avoid using a blender, it just gets too mushy. 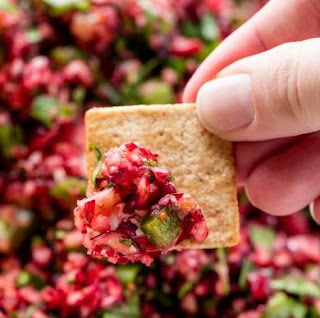 Coarsely chop the cranberries in a food processor, or by hand. Place in a mixing bowl. Finely chop the green onion, cilantro and jalapeño. Add to the cranberry mixture. Add the sugar, cumin, sugar, salt and lime juice. Stir to combine all the ingredients. Let the salsa sit in the refrigerator about 3 hours before serving. Serve with good tortilla chips. 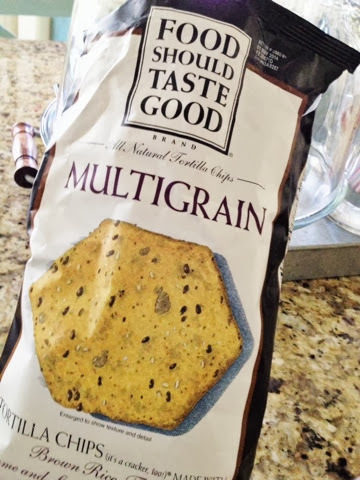 I highly recommend Food Should Taste Good Multigrain Chips. You can find them at Walmart, and sometimes at Costco.